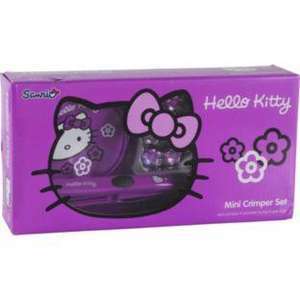 A limited edition gift set containing a 200°C nano crimper in striking purple with an eye catching Hello Kitty motif. Comes with a matching patent cosmetic purse and 6 flower-shaped jaw clips. Hot! Many thanks, been looking for a crimper for a while. Thanks Op, been looking for a decent cheap pair for our daughter, so that one of xmas presents sorted. I wouldnt bother even for a child, the crimpers are poor and being mini crimpers means it would take hours to crimp your hair not to mention get really hot and hard to handle after awhile. It would be better to get babyliss crimpers or another good make as these will just be disappointing and a waste of money.